The driving question of the Magliery Lab is in the sequence basis of protein stability and other biophysical properties. We use high-throughput and statistical methods to explore the effects of sequence changes in model proteins, including High-Throughput Thermal Scanning (HTTS), a HT implementation of a dye-based approach to measuring protein stability, and information theory-based analysis of sequence variation and co-variation. We apply these and other engineering approaches to improve the properties of proteins for use as diagnostics and therapeutics, with an emphasis on physical properties such as stability, solubility, and oligomeric state. Key targets include detoxification of chemical agents, cancer imaging and cell targeting, and modulation of immune pathways in cancer. 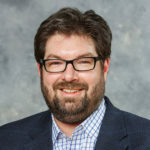 Thomas J. Magliery is an associate professor in the Department of Chemistry & Biochemistry at The Ohio State University, and he is also the vice chair for graduate studies. He is a faculty member in the Ohio State Biochemistry Program (OSBP), Biophysics, Chemistry, and Microbiology graduate programs. He is a co-director of the NIH T32 Molecular Biophysics Training Program (MBTP), and a trainer for the Cellular, Molecular, and Biochemical Sciences Program (CMBP). He is the faculty director of the Ohio Five-OSU Summer Undergraduate Research Experience. He is also the Chief Scientific Officer for Enlyton, Ltd., a Columbus-based biotechnology start-up. See his biography page for more information. Our understanding or protein stability would be improved if we could examine a large number of mutations in a single protein scaffold, but methods to measure stability tend to be labor and material intensive. We have taken the approach of combining cell-based screens and selections with multiwell in vitro measurements to examine libraries of mutants in well-understood model proteins. A key contribution has been to couple high-throughput purification with dye-based differential scanning fluorimetry/Thermofluor®, to examine variants in parallel in 96 well plates, a technology we call High-Throughput Thermal Scanning (HTTS). A major target for this work has been the well-studied four-helix bundle protein Rop, but we have applied HTTS to proteins from enzymes to antibodies. We continue to develop complementary methods for other proteins. These experiments allow us both to add precision and completeness to our understanding of phenomena like core packing, but they also allow us to explore the effects of mutations in areas such as surfaces and loops where we have less of a fundamental understanding of the controlling parameters. To facilitate library studies of Rop, we have engineered and characterized a Cys-free pseudo wild type. We first bin variants by activity, using a cell-based GFP expression screen, and then characterized variant using HTTS and other biophysical approaches, such as CD thermal melt, NMR, and X-ray crystallography. Some of the areas that interest us most are core packing, surface mutations, loops constraints, heptad repeat constraints, and dimer topology. We are also interested in the molecular details of how Rop modulates plasmid copy number. We are examining sequence-stability relationships in several other model proteins, including the mostly beta DNA binding domain of p53, the DNA binding domain of LacI family proteins, a Cys-rich Euplotes hormone Er-23, and a small model beta protein, GB1. We can create and screen protein libraries, but nature has already provided large libraries of proteins with nearly identical structure and function, but differing sequence. We have set out to understand that sequence variation by dissecting the roles of conserved positions versus the roles of co-evolving positions. The fundamental question we are asking here is, what information is encoded in individual positions of a multiple sequence alignment, versus what information is encoded in how positions co-vary (i.e., are correlated). We have developed an approach to analyzing sequence variation and co-variation using information theory metrics (relative entropy, mutual information), and we have largely applied it to metabolic proteins, due to their ubiquity and assayable functions. Our first experiments in the area involved constructing two closely-related consensus variants of triosephosphate isomerase (TIM), which differ dramatically in their properties despite differing only in a small number of unconserved positions. A number of lines of evidence show that many of these unconserved positions may co-evolve with other positions, and consequently cannot be varied independently. We continue to explore the physical etiology of these interactions using selection and next-generation sequencing. We have carried out similar analyses of other metabolic proteins, such as superoxide dismutase (SOD1) and adenylate kinase (ADK). The effects of mutations in conserved and correlated positions suggest a possible algorithm for stabilizing proteins from family sequence information alone. We have tested a simple implementation of this algorithm and several different variants of TIM and ADK, as well as several DNA binding protein families, and it is remarkably successful. We continue to refine key parameters, like phylogenetic distribution of the sequence database, and cut-off values for conservation and correlation, with the goal of producing a simple, highly effective approach to creating active, stable variants of any protein of interest. Natural proteins have tremendous potential as diagnostic and therapeutic agents, due to their complex functions and high specificities compared to small molecules. But they also present profound challenges, including in production, storage, and serum lifetime due to poor stability, solubility, or expression. Their serum lifetimes are also a function of size and interactions that may not be suitable for the pharmacological effect sought. We aim to use a combination of rational, library, and statistical approaches to produce protein variants that are stable, soluble, expressible, and have pharmacokinetics tuned to the job at hand. Organophosphorus (OP) nerve agents and pesticides are a human health and terrorism threat. There are not currently safe, non-sedating antidotes that can be deployed in mass casualty situations. In collaboration with partners at the U.S Army Medical Research Institute of Chemical Defense (USAMRICD) and the Weizmann Institute, we have extensively explored the use of variants of the human serum hydrolase paraoxonase I (PON1) as a possible OP intoxication treatment. Our work has focused on the expression, pharmacokinetics, and mechanism of PON1. Work to broaden the activity of PON1 to other types of OP substrates continues. We have more recently also focused on a variety of approaches to control the pharmacokinetics of PON1 and another candidate therapeutic enzyme organophosphorus hydrolase (OPH), delivered by different routes of administration, in collaboration with investigators at Wake Forest, Southwest Research Institute (SwRI), and USAMRICD. In collaboration with a group of surgical oncologists, pathologists, and radiologists at the OSUCCC – James, we have engineered highly stable antibody fragments targeting an adenocarcinoma-specific cancer marker, TAG-72. A major focus of the work has been in creating variants through chemical modification or linker engineering that have serum lifetimes that match the process of care for diagnostic, imaging, and therapeutic applications. Along the way, we have discovered surprising differences in linker length-oligomeric composition relationships from what has been previously reported. Our current work is focused on expanding the use of this antibody fragment platform for other diagnostic applications, therapeutic effects, and possible intracellular functions. This work has been supported in part by Enlyton, Ltd., which has licensed intellectual property developed in the Magliery lab from OSU. Magliery is an officer in the company and a shareholder. Enlyton, Ltd., is a Columbus-based start-up that is partially owned by OSU. In collaboration with David Carbone and Mikhail Dikov at the OSUCCC – James, and in partnership withe the Drug Development Institute there, we are exploring the use of engineered monovalent and polyvalent variants of Notch signalling pathway ligands to inhibit or activate immune responses. These agents potentially represent unique pharmacological approaches to automimmune disease and cancer immunotherapy, as well as tool compounds to dissect the complex biology of the Notch pathway.